This image helps to demonstrates some of the odd consequences that occur when galaxies invade each other's gravitational zones. The large galaxy in this image is NGC 4725, and it has gravitationally collided with NGC 4747 (Arp 159), the galaxy in the upper left corner. As usually happens with these types of interactions, the smaller galaxy overall loses the contest. In this case, NGC 4747 shows a highly warped structure, and an extended and faint tidal tail stretching into the upper left corner. 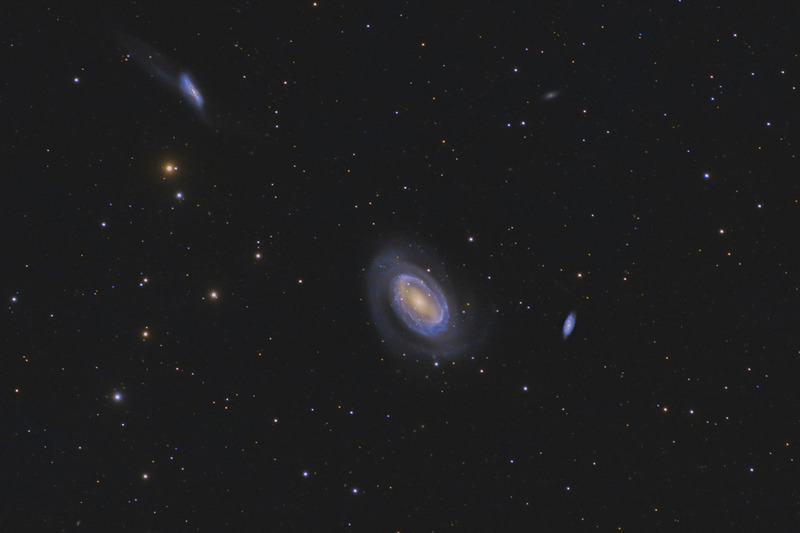 Nonetheless, NGC 4725 does not leave the battle unscathed. During the course of the encounter, it lost one of it's spiral arms - leaving it with only one arm. Additionally, it's galactic center is now an active nucleus, turning it into a Seyfert galaxy. As often happens during galactic collisions, NGC 4725 has also spurred a great deal of star formation. Moreover, it shows evidence of a tidal stream, displaying an extended halo of stars around the galaxy. In this image, North is Up. This image is cropped to 30% of the original full frame. Software Used Images Plus 6.0 for camera control, Images Plus 6.5 for calibration, stacking, color channel splitting and recombination, ArcSinH stretching, star size reduction, edge masking, and masked stretching. Photoshop CS5 used for levels and curves, lab color, saturation adjustments, selective color, match color, screen mask invert, and high pass filter. Gradient Xterminator for gradient removal. Carboni Tools for additional noise reduction and smoothing. HLVG for additional color correction. Registar 64 for subexposure alignment and color channel alignment. Pixinsight 1.8 for image annotatcion. Focus Magic for focus restoration. Notes I was glad I was able to pull out NGC 4747's faint tidal tail with this image. While the focal length of my Nikon 600mm is not ideal for these relatively small targets, I feel I was able to pull out some decent details. In retrospect, I regret that I didn't capture some data with my 2x Powermate in order to bring out some sharper details in the main galaxies. Perhaps I'll try to supplement the data next year to improve the image further.